Sterling Davis is settled in Glasgow, a city he describes as "wet", "metropolitan" and "territorial"
Glasgow Rocks' Sterling Davis has announced his retirement from playing so that he can focus on coaching the team he has represented for nine years. Davis has been player-coach of the franchise for the past eight seasons and is relishing the prospect of his new role for the 2015/16 BBL season. He told BBC Scotland: "It's always a tough decision after playing so long. "I am looking forward to being able to focus on tactics instead of focusing on the physical and tactical aspects." 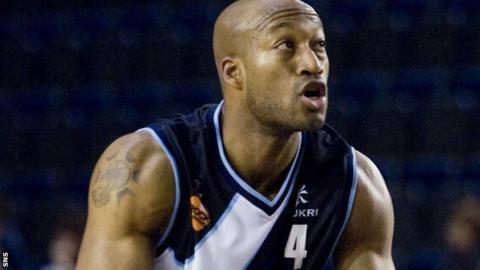 The American-born player joined the Rocks during the 2006/07 season and made more than 300 appearances, scoring an average of 10.66 points per game. "I thought this was a good time to go ahead and make that transition," he continued. "I just want to continue to make sure we are competitive every year. "We try to focus on being professional in everything that we do and we take pride in how we do it. "We have grown as an organisation and we have improved our fan base. Now our priority is to get some silverware coming back to Glasgow."